England manager Gareth Southgate was in realistic mood before this opening Uefa Nations League meeting with Spain - refusing to put any gloss on what he described as their "non-existent" record against the world's best. It did not get any better in this 2-1 defeat and if there was a night designed to illustrate Southgate's point and put England's current place in the global order into perspective - despite that run to the World Cup semi-final - this was it right here at Wembley. England and Southgate were never labouring under any delusions of grandeur despite the euphoria of the summer in Russia and anyone who was received the coldest of showers as Spain demonstrated vast superiority despite recent problems of their own. Spain may have dropped below England in the Fifa rankings since the World Cup, they are now ninth to England's sixth, but under new coach Luis Enrique they were by far the more accomplished team for long periods, inflicting a brutal reality check on the progress Southgate's side has made. Southgate said: "We are under no illusions. We are still at the early stages of what we want to do. This was a tough test in terms of pressing and a team who are so good in possession. "We have to keep reviewing and looking at what we do but we want to stick to the plan and get better at what we do." England received the perfect start with Marcus Rashford's goal but this only served to jolt Spain, in transition themselves after a chaotic World Cup which saw coach Julen Lopetegui sacked on the eve of the tournament after taking the Real Madrid job, into action. Spain equalised instantly through Saul Niguez and proceeded to show a control and creation England simply could not match, with sharp and crisp passing and movement that frustrated Southgate's side and a Wembley crowd that had come to celebrate that World Cup achievement. The Russian odyssey around Volgograd, Nizhny Novgorod, Kaliningrad, Moscow and Samara may have elevated the status of Southgate and England - but it was right back down to earth on home soil. England were not lacking in effort. They were lacking in quality. There were spells within this game when they were outclassed by a Spain side trying to find their own path back to success. Southgate knows England need a statement victory. For all the goodwill of the summer they came up short against a side of Belguim's quality either side of that semi-final loss to Croatia. And even though they staged a late siege of sorts, when Spain fell back to protect the result and England applied some old-fashioned long-ball pressure, they rarely looked like getting it on this occasion. England, who are undoubtedly in a position to make progress under Southgate, are hammering at the glass ceiling put in place by superior opposition and currently do not possess the quality or the street-wisdom to break through it. This is not the Spain of old, the Spain of Xavi and Andres Iniesta. It is a Spain under renewal after their golden era - but they still possessed too much for England on a chastening night at Wembley. Southgate has many of the building blocks in place to renovate England as he attempts to build on the platform established by the World Cup - but one crucial piece is missing and shows no sign of being uncovered. England simply do not have the creator or the class in midfield that allows them to dictate terms and control games against the best. We saw it in Russia in those defeats to Belgium. We saw it painfully in the semi-final against Croatia when Luka Modric and Ivan Rakitic were the great orchestrators of tempo and rhythm, manipulators of the ball in the crucial phases in Moscow. And we saw it again at Wembley as England's midfield was all endeavour but non-existent when it came to creativity. Tunisia, Panama, Colombia - albeit on penalties - and Sweden are well within England's compass but the best remain out of reach. This is not criticism. This is cold fact. Southgate said: "They pressed us and we didn't keep the ball well enough but I have to give the players credit. We could have folded and disappeared but in the last 25 minutes we could have got a draw. "They pressed well and it took us a bit of time to work out where that was coming from and find solutions to it. We are still finding our feet in playing out. We can go back to an old style but we will never be a top team or we can stick with what we are doing and accept it won't always work. "The system in Spain has produced some of the best midfielders in the world. We are a different profile of player. We can't play like they do but we can move the ball. When we are match fitter we will function better higher up the pitch. It takes time. We have come a long way." It was revelatory that England's best successes came with a more back to basics approach than trying to play Spain at their own passing game. Southgate's search for a creative midfield force is a matter of urgency but he cannot conjure this up out of thin air. Jordan Henderson is a midfield pivot but he not a creator at international level and when Southgate replaced him after 63 minutes it was with Eric Dier, hardly a game-changer. Ruben Loftus-Cheek has shown potential but only in flashes and he gets no game time at Chelsea. Newcastle United's Jonjo Shelvey has his admirers but is hardly the name to make the world's best break out in a cold sweat. Manchester City's Phil Foden is marked out for a golden future but he cannot be expected to carry such a weighty burden at just 18. Southgate tried to offer more creativity by using Henderson as the foundation with Dele Alli and Jesse Lingard as the more attack-minded players but Belgium, Croatia and Spain have put their flaws into sharp relief. England need the midfield creator to make a difference - but the cupboard is ominously bare. 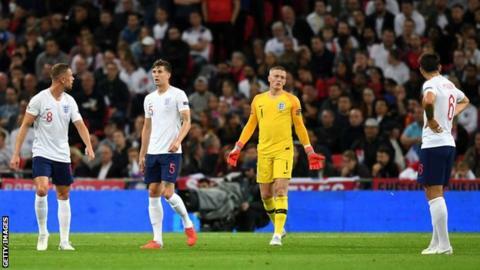 England may have had some of that World Cup optimism put into context in this opening Uefa Nations League game - but this was hardly a night of solely bad news for manager Gareth Southgate. As he rightly said, England could have sunk as Spain passed their way around them and dominated - but the character and resilience of Russia is still intact. England hung in and could have earned a point they would not have deserved with a late rally, only denied by a controversial decision from Dutch referee Danny Makkelie to rule out Danny Welbeck's finish for a foul on David de Gea. It was to England's credit that they never let their heads drop. Southgate's side did not lack fighting spirit - it was a lack of quality that was their undoing.